Do you need to display stock information in an interactive SAP BusinessObjects Dashboard model? This post shows how to do just that. With as little as two components – the Candlestick Chart and a List Box – you can create and deliver an hour-by-hour and interactive display of stock performance for a selected day. Download the full-screen version, XLF file, and sample data at the bottom of the post. Stock and commodity trading specialists can analyze the patterns created by a Candlestick chart to make crucial decisions about which products to buy/sell and when to buy/sell them. Patterns in a Candlestick chart can illustrate bullish and bearish trends, trend reversals, indecision of traders, complex stick patterns, and much more. Day traders and long-haul investors alike can employ the centuries old practice of Japanese Candlestick Charting and interpret data patterns in Xcelsius to identify marubozu trends, spinning tops, doji patterns, paper umbrellas, hammers, shooting stars, and many more. And it can all be done within an easy to customize Xcelsius dashboard! Let’s begin by launching Xcelsius then inserting a spreadsheet with 4,956 rows of trade data. To use all 4,956 rows, you must increase the maximum number of rows in your instance of Xcelsius. 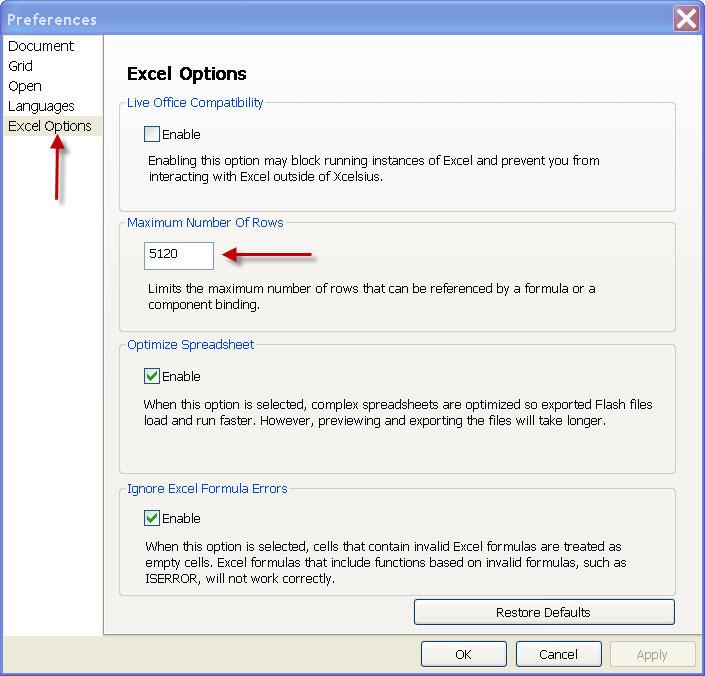 This is done by clicking File -> Preferences, then selecting Excel Options in the list of Preferences. From here you can manually adjust the Maximum Number of Rows from the default of 512 to a much greater number. (Use caution when increasing the limit to beyond 5,000 rows). The screenshot below shows the Maximum Number of Rows being increased to 5120 from 512. Once the data has been inserted, locate the Candlestick Chart component and List Box then drag them to the report canvas. (Use the Combo Box if you prefer to use it rather than the List Box). Position the components the way you prefer and add a background object or two layered behind the primary components. Destination: Select a range that will hold all the values of a unique date (and a few extra rows – just in case). In my example, I set the Destination to (I12:N106). The steps above allow you to grab all the values for a selected date and pass them to the I12:N106 range. 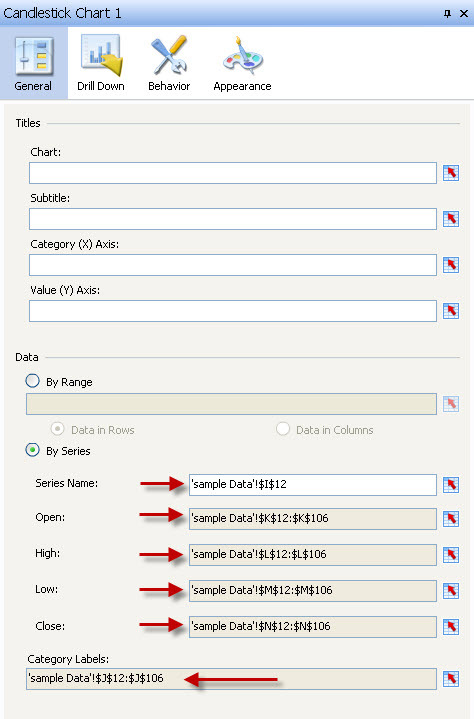 We can then bind the Candlestick Chart to these values, allowing the chart to change every time a new date is selected. Tip: My personal preference is to delete the chart title and subtitle then add Text Labels to the canvas and bind to dynamic titles and subtitles or enter static title values. The screenshot below shows the Candlestick Chart bindings to the dynamic values in the spreadsheet. Run it, test it, scroll through the dates, and watch the chart change. Once you see the chart in action, you’ll begin to get an idea of how you’d like to modify the colors and how you’d like to modify the layout of your components. Below are the files used to create this example. Included are: Sample data, XLF model, and SWF file. Posted in: Articles, Charts, Components, Dashboards, Examples, Excel, Fun, Interesting, MS Excel.